Last week’s advice for Christmas was restraint—don’t go with high-dollar wine that will not be appreciated amid Christmas chaos and celebration. Ruby color; cherry, spice on the nose; cherry, mocha, raspberry, blackcurrant tang, suggestion of toasty oak on the palate; well-behaved, silky tannins; medium-full body. Fresh, very clean with balance and some structure, pleasant finish; a real achievement for the price, but that is what you expect from New Zealand today. And Nobilo is one of the reasons you expect that from New Zealand today. Nobilo’s story begins in 1936 as war clouds gathered and Nikola Nobilo immigrated from Croatia to New Zealand. 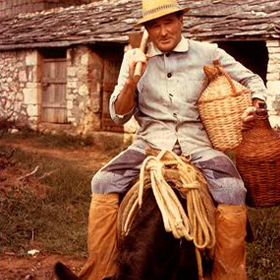 In 1943, Nikola planted his first vines, drawing on more than three centuries of family wine making experience. Nikola was early advocate for premium varietals, pushing New Zealand wine makers to compete with the world. He also fought New Zealand’s bizarre booze laws that prohibited wine being served with meals in restaurants (the United States does not have a monopoly on idiocy when it comes to alcohol-related law). In the 1970s, Nikola pushed New Zealand into focusing on sauvignon blanc and pinor noir and played a leadership role in developing Marlborough as a wine region. For his efforts, Nikola was awarded the Order of the British Empire in 1994.